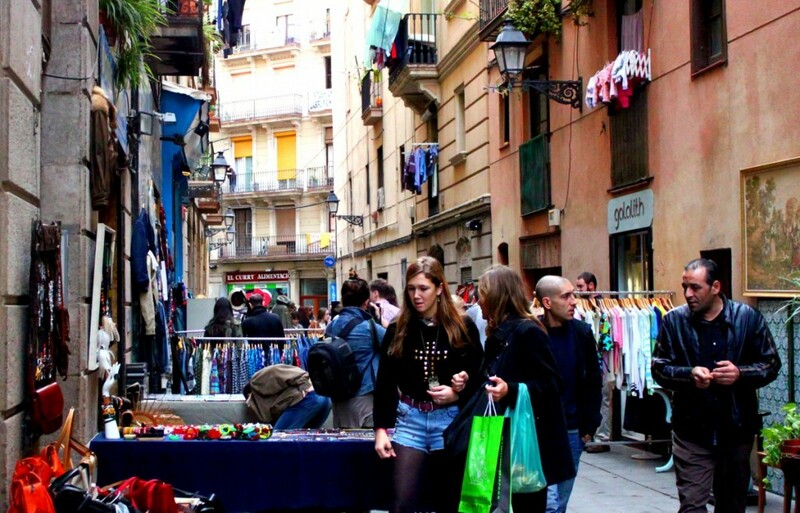 Barcelona’s famous for having great shopping streets – Passeig de Gràcia and Portal de l’Àngel are probably the best-known – but if you’re looking for something a little less Zara and more unique, here’s some of the best vintage shopping in Barcelona, including some of the top flea markets too. 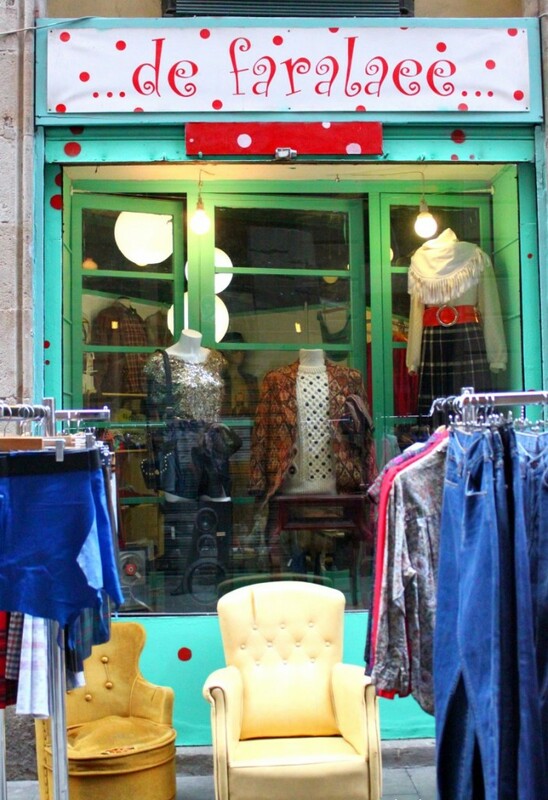 There are two big streets in the city center for great vintage finds: Carrer de Tallers and Carrer de La Riera Baixa. Both are packed full of shops, so it really depends what you’re looking for. Carrer de Tallers offers all kinds of secondhand or original items. From vintage clothing to old punk records to military stores, you can find pretty much anything on this street. There are so many stores on the street it’s easy to miss the one you want. My favorite store on this street for fun vintage picks is the reasonably priced Retro City (C/Tallers 47). Side note: Retro City is where I found an amazing sparkly crop top that led to my favorite piropo so far in Span – “¡Chiquilla, pareces una burbuja de Freixenet!” (“Girl, you look like a Freixenet bubble” – a type of fancy cava from Catalonia). You can also find the famous Holala! at C/Tallers 73. They have high-quality, handpicked vintage clothes and items. The less unusual items are similarly priced to the high street shops, but some of the truly unique pieces can cost hundreds of euros. I picked up an amazing pair of detailed leather cowboy boots, only to be shocked at the €850 price tag! Carrer de La Riera Baixa, down past the MACBA, is a short pedestrian street filled with almost all vintage shops. It’s mostly clothing shops, but there’s also a record store and a shop that sells Spanish leather bags. I even found a real old flamenco dress in one store! On Saturdays from around 1 p.m. onwards, the shops spill out onto the street and have market-style stands, along with some of the neighborhood residents who set up their own tables. There’s a big range of price points in the shops, so you can probably find something to suit your budget. My picks on this street are De Farelee, Lullaby, and Muy Interesante. 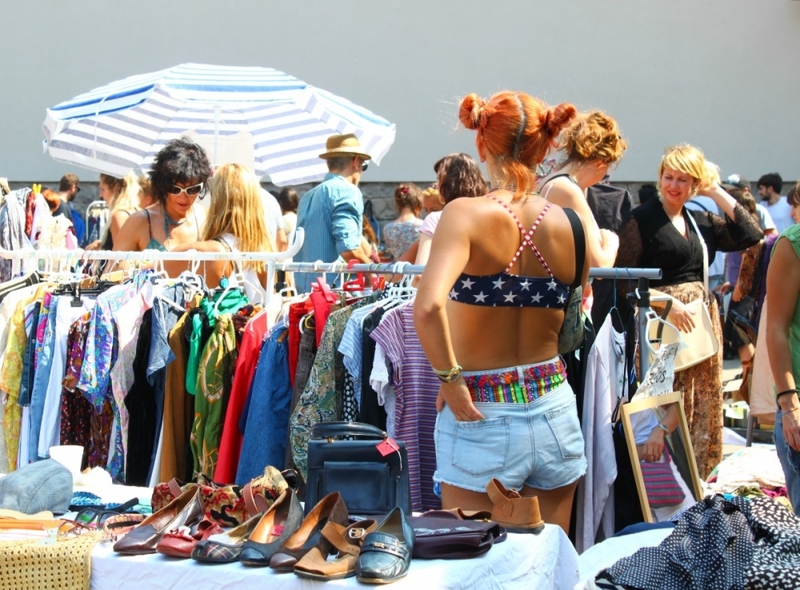 Now, let’s move on from the city’s best vintage shopping to the best flea markets in Barcelona. Barcelona’s biggest street market is Els Encants, which is open every Monday, Wednesday, Friday and Saturday from 9 a.m. to 5 p.m. It’s been around since the 14th century, and it’s a huge open-air outdoor flea market. Street vendors sell everything from antique furniture to old clothing to books and CDs to random household items. It’s big and chaotic, and there are some great deals if you’re patient enough to unearth them. Check EncantsBCN for information about special events in the market. There are also markets in Plaça Reial (10 a.m. to 2:30 p.m.) and near Drassanes metro station (10 a.m. – 8 p.m.) on Sundays. Check Plaça Reial for old items like stamps and coins, and the Drassanes market for handmade artisan jewelry, scarves, toys, and so on. One thing you probably won’t see in your guidebook is the thriving mobile street market scene in the city. The issue? It can be a little tricky to find out until the last minute when these markets will be held. Usually, the markets are announced the very same week they’re held on Facebook or Twitter. Check out Flea Market Barcelona and Two Market for up-to-the-minute announcements about secondhand markets going on in the city. The information may only be in Spanish, but the dates are easy enough to find and there’s usually at least one vendor who speaks English around. The vendors tend to be very chatty and friendly. The last time I went to one of these markets, I ended up in an hour-long conversation with a petite Argentine woman intent on telling me her whole life story. Between fiddling with her four cell phones and lamenting her latest love crisis, she somehow managed to sell me a ridiculous burnt orange minidress that unzips from collar to hemline. While I’m sure it would lead to many interesting incidents, I don’t want to end up dancing en pelotas in a club anytime soon! Other hot spots to look for vintage or secondhand finds? Try poking around the trendy Gràcia or Born neighborhoods for a rotating cast of interesting little shops. Unfortunately, due to la crisis, the ones I like tend to shut down or move! The Facebook group “Barcelona por cuatro euros” (Barcelona for four euros) announces markets as well as other cheap events going on in the city. What’s your favorite way to shop in a city? 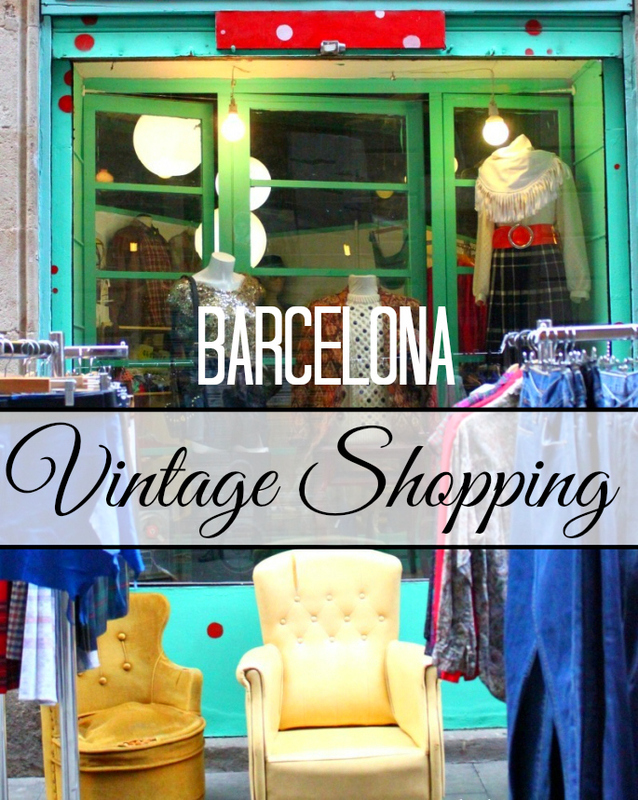 Do you know of any great places in Barcelona for vintage or secondhand stuff? I love vintage stores. My favourite vintage stores in a city are down Camden Passage in Angel, London. You can find anything from vintage dresses, shoes, jewellery and other cute items like photo frames and furniture! I LOVE vintage shopping in London! There’s so much interesting stuff just waiting to be discovered. I wish I had known about all these places when I was in Barcelona! I love vintage shopping! Thanks for sharing! This is amazing! I’m a fan of browsing through flea markets. I’ll make sure to check these out the next time I’m there! Thanks! The flea markets here are a lot of fun, even if it’s just for people-watching. The other day I had to take photos in a place called Flamingo… it’s huge and you have to weight the clothes and then pay for the kilos. It’s in carrer Ferlandina, next to Macba! The streets at night are a great place for a find or two… I once got an entire back catalogue of 1960s craft magazines from Parallel… My favourite find ever, the pictures were incredible. Oh wow! That sounds amazing. I’ve found some pretty spiffy furniture but nothing that cool in the streets. I will definitely be looking for these shops next time I’m in Barcelona – great post! Thanks! I love street markets too, although sometimes in Barcelona they mark up the prices a lot for vintage, unfortunately. Thanks for this we followed your suggestions and found some great clothing items. We are from Australia and have lots of vintage and recycled clothing shops in our neighbourhood. If you come to Australia and are in the city of Brisbane, come to Annerley Junction and you’ll find them. I’m glad to know you found some good stuff! Australia is definitely near the top of my list of countries to visit, so if I’m in Brisbane I’ll stop by Annerley Junction. Thanks for the great tip! been reading through and love your blog. Thanks for all the helpful info. Could you help me with places where I could get shoes for my daughter aged 8years old. reasonably priced but sturdy. Thanks. thanks Jessica….. I will check that out.Also wanted your advice on where I can find reasonable priced shoes for women in Barcelona. Thanks. There’s a famous shoe shop called La Manual Alpargatera that does shoes, especially espadrilles. It’s quite a cool place to go and look around! They do kids shoes too, I’m pretty sure. Thanks Jessica. Actually my husband is down in Spain on work and Im based in India so Im kinda helping him out with women’s shopping places for my daughter and myself. He is going to be in Barcelona with two other colleagues for three days , that’s why your website has been so informative and resourceful. Keep it going and all the best. Regards, Donna. In vara anului viitor – Iunie 2014 , intentionam , eu impreuna cu sotia mea sa vizitam frumoasa BARCELONA ! Am cumparat deja biletele de avion ! Din cele scrise aici – cred ca ne-am dori sa te cunoastem si eventual sa primim niste sfaturi AVIZATE de la tine ! Pentru a-ti face o idee despre noi intra pe youtube si da cautare : Geo Pop – Colectie de pendule ! Daca vreodata intentionezi sa vizitezi *** TARA LUI DRACULA *** – Romania , te asteptam cu drag la BUCURESTI ! In the summer of next year – in June 2014, we intend, my wife and I to visit beautiful BARCELONA! I already bought tickets! Of those written here – I think we want to know you and eventually get some expert advice from you! To get an idea about us go on youtube and yes Search: Geo Pop – COLECTIE DE PENDULE ! If you ever plan to visit *** COUNTRY’S DRACULA *** – Romania, you’re welcome to Europe! – heard about mango outlet, is it like “factory outlet” where they normally use to clear out old stuffs ? Worth a visit ? Looking forward ti hearing from you ! -I like the Mango outlet, there are definitely some good bargains to be had there. There’s one on C/Girona, I think, near Gran Via, and another by the Sant Antoni market. Of course, like any outlet store it’s luck of the draw, but I’ve had good luck there. -I don’t know of any other special discounted shops specifically, but January is a GREAT time for the after-Christmas sales! You’ll see “rebajas” or “rebaixes” in the shop windows advertising their sales. Passeig de Gracia is a good spot for high-end brands, and almost everywhere has sales in January. There is a new vintage style sho called El Dragonfly in Carrer dels Sombrerers, next to the Santa Mariadel Mar, in El Born area of Barcelona, I’d recomend it, if your in the area, its definetly worth a look. Cool, next time I go vintage shopping I may have a look! Thanks for the suggestion. I love Barcelona and all the markets you can find around the city! you didnt mention “BrickLane BCN” or “Lost&Found” though..
hi Jess, love yr post 🙂 I am going to Barcelona next week and I love vintage shopping. Heard that most shops close on Sundays, do u know these vintage stores will open on Sunday then? If not, I don;t know what to do on Sunday 😛 Thanks so much! This is great info! I’m visiting the last weekend of jan for my 30th bday. Do you know what the opening hours are of vintage shops and also high street? Also, I lived in barca about 7 years ago and mango and Zara were so cheap. Is this still the case? Thank you!!! Happy early birthday! 🙂 Smaller shops are usually open in the morning (probably 10-ish) to lunchtime, when they might close for the siesta hour. They open back up around 5. Not all shops do this, but it’s good to check. The stores on the high street stay open with no break for the siesta. I think Zara and Mango are still pretty inexpensive – plus, it’s rebajas right now.